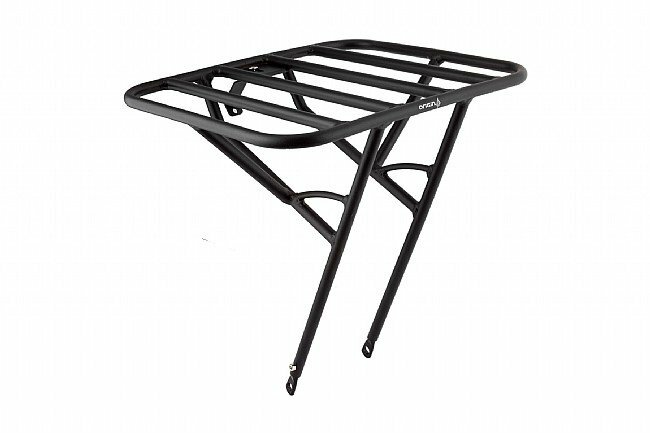 The Origin8 Classique Cargo HD Front Rack is a versatile platform-style rack that adjusts to fit 26", 27", 29" or 700c wheeled bikes. The 12" x 14.5" platform is large enough to carry 55lbs of gear, constructed from heavy duty aluminum alloy tubing. The easy mounting system allows for the rack to be mounted to the front wheels axle and front brake caliper, providing a secure connection between rack and bicycle. The Origin8 Classique Cargo HD Front Rack is not compatible with panniers. I got this rack for my commuter to carry my laptop and a small tool pack, that I previously carried in a messenger bag (no more sweaty back). I use bungee cargo netting and other miscellaneous straps to keep the cargo secure while riding. The design lends itself to a lot of tie down points. Super solid construction and surprisingly lightweight. It also works well to transport a small cooler with a six pack of beer and perfectly fits a 12-pack on it's way back from the store. Love the way this fit on my Surly Wednesday Fat Bike. It was a tight fit but our bike mechanic made it work. Great quality rack, perfect for my camera bag and anything other small bag I would like to bring with me.